This set is perfect for the beginning engraver. Included are a ready to use graver and 2 oz engraving hammer made by Michael Lea. Mr. Lea has been a gunsmith since 1967 and was the head gunsmith at Ohio Village for over 10 years. He is an accomplished artist and is listed in the Williamsburg catalog of Master Craftsmen as well as featured in Early American Life Magazine. Many of you may know him from Friendship or the living history circuit as "The Gun Doctor". These tools are made and designed by a master craftsman who really uses them to create masterfully engraved pieces of art. Also included is a Magni-Focus optic visor with an 8" focus to see the intricate details of the work, a 4" x 8" x .032" thick brass practice plate, a 4" hard Arkansas sharpening stone in a wood box, a tube of Chinese White for transfer and layout work. 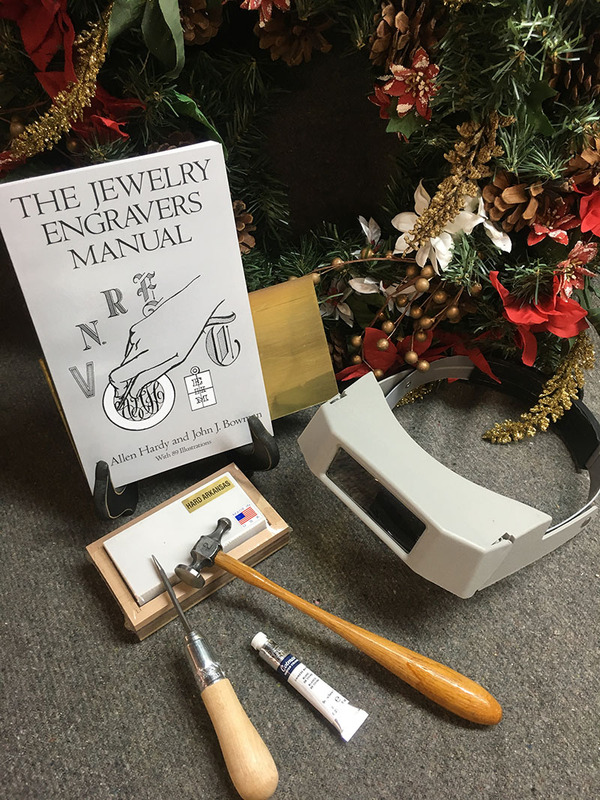 Finally a copy of The Jewelry Engravers Manual. This book is an invaluable reference for any engraver regardless of the item being engraved. This book covers everything from making gravers from blanks, proper hardening and heat treating techniques, cutting, lettering, and much more.